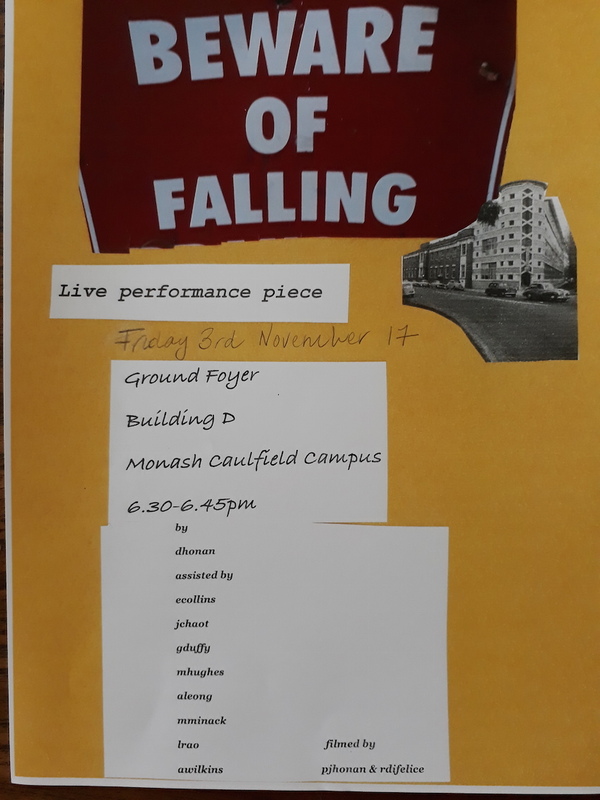 “Beware of Falling” is the title of my final performance piece of my second year Bachelor Of Fine Art. It concluded my 2017 study year at Monash University, Melbourne. The formative work began as a response to a studio project entitled ” A Narrative Tale”. Initially I decided to photograph my wardrobe. This took some time and involved the photographing of four hundred and two items of clothing. All my clothes are sourced from flea markets, vintage sales, opportunity or charity shops, garage sales and online second hand sites. I habitually buy only second hand items. This is a personal habit formed over many years. 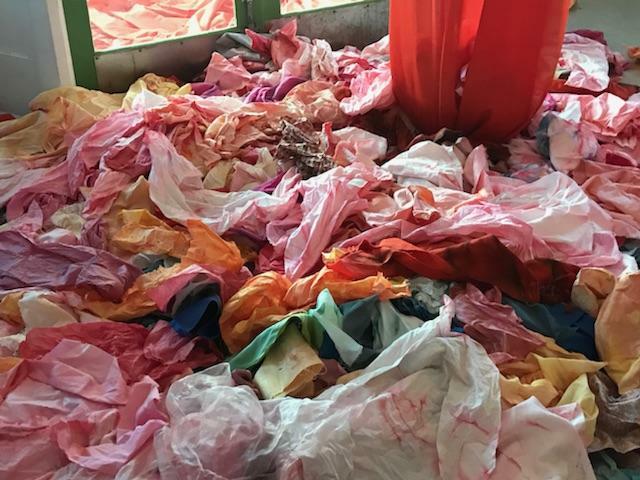 Financial circumstances made recycling an initial lifestyle choice. As a visual artist I employ an ongoing aesthetic of repurposing the found object . This combined with my love of the old, quirky and undervalued has continued to inform my purchasing choices. 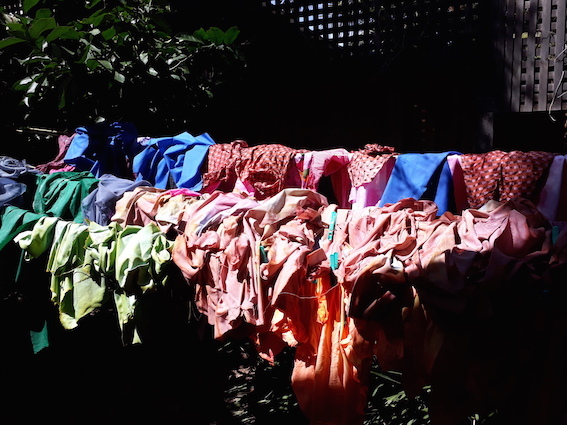 As a weekly volunteer at a local op shop and keen sewer I have great resources and the ability to refashion rehoused items. A thirteen hour photo shot started the process which took on many iterations over the course of the 2017 year. Photographic displays, artist books, diagrams and sculptural pieces, drawings and collages extended the theme. 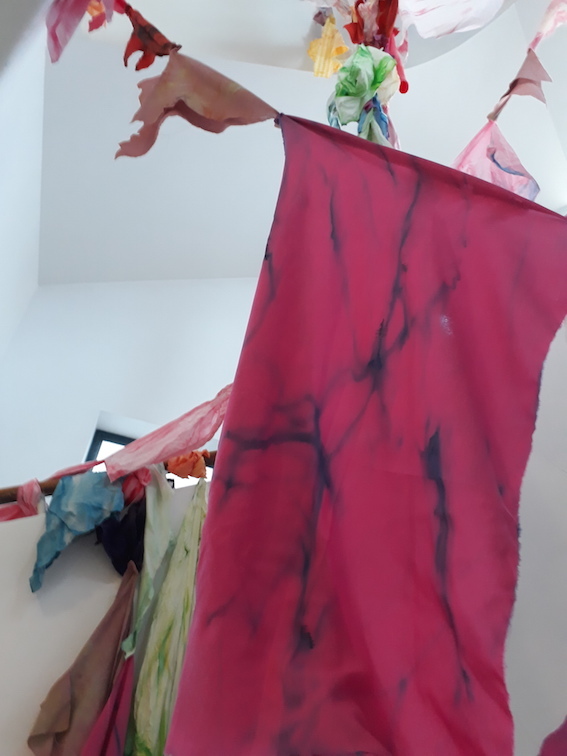 Further work included using large quantities of fabric to create installation pieces, which were hand dyed, silk screened, torn, stiffened or embellished in some manner, all bearing the hand of the artist. 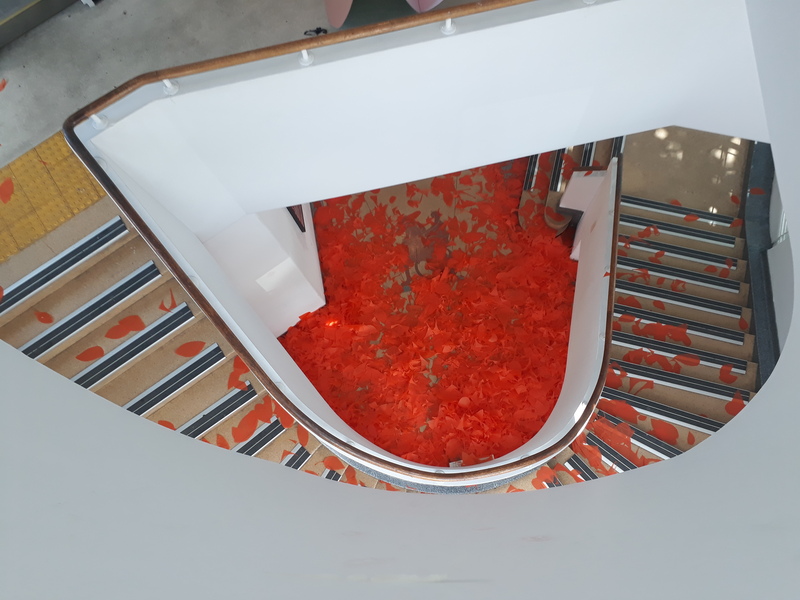 I played with fifty metres, twenty metres and ten metres of fabric in various configurations in the stairwell at Monash University Building D. It rapidly became my work space, informed my methodology and forced me to address questions of scale and spatial practice. 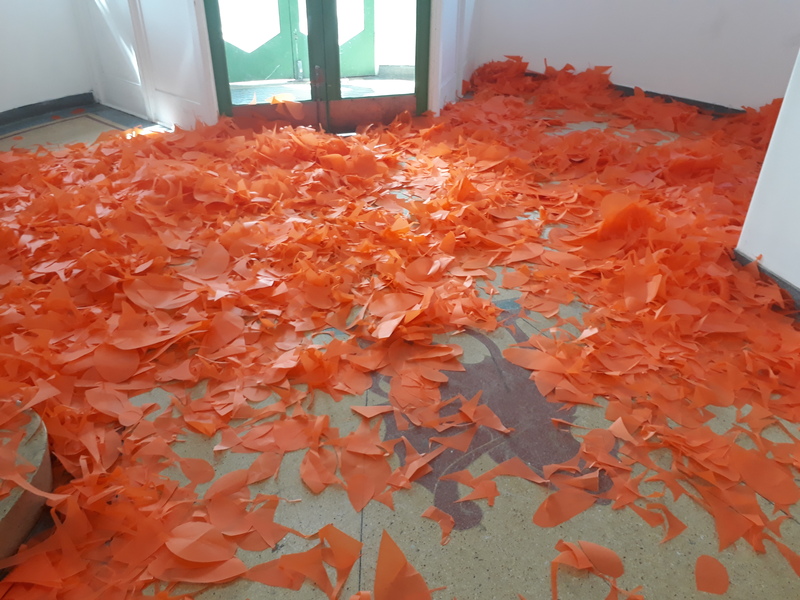 My final iteration of the work took the form of a performance piece at the end of year show. 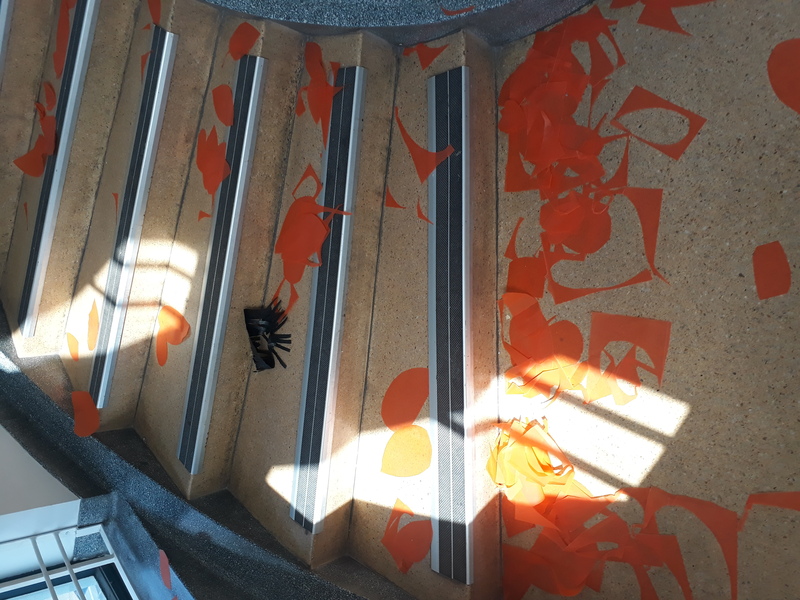 I recruited several helpers who were to drop their specific bag of colour coded fabric into the stairwell onto the swathe of a sixty metre piece of orange fabric hung there . It was a total of four hundred and two pieces of fabric to replicate the original four hundred and two pieces of my wardrobe. The overall process involved a huge amount of physical labour, manual manipulation and lengthy thought process. It involved a prodigious following through of the original concept . Much collaboration was required, reliance on participants labour and skills. Uncertain as to the outcome it addressed my interest in public performance, trained me to address spatial concepts and fed my imagination. Never satisfied or appeased my restless search in my practice is continuing. What do viewers take away from a performance? How is the non static judged? How important is it to leave or maintain a permanent record of work.